Welcome to Kohlmeyer Exterior Home Fashions. We're here to help you keep your home in tip-top shape! 1. Years of reliability. Kohlmeyer, Inc. has been earning trust for over 30 years from literally thousands of costumers, both residential and commercial. This experience is proof that "you can trust your house to Kohlmeyer, Inc."
2. Quality products. Kohlmeyer Inc. offers quality products that value-minded customers appreciate. And each and every product is backed by a strong product warranty and skilled repair service. 3. Warranties you can trust. 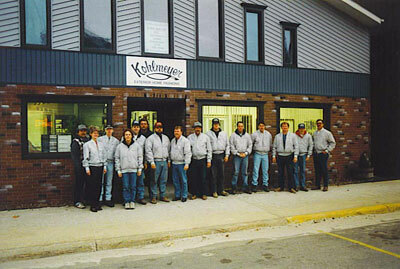 Kohlmeyer, Inc. warranties the products and the complete installation in writing. And you know that Kohlmeyer, Inc. will be there when you need us. 4. Professional installation. Kohlmeyer Inc.'s authorized installation experts will handle your job and we'll take full responsibility for the entire project, complying with all local laws, codes, regulations, and ordinances. 5. Insurance protection. You get three-way insurance protection covering liability, property damage, and workmen's compensation while the job is in progress. 6. Free planning and estimates. A trained Kohlmeyer, Inc. home improvement specialist will come to your home and help you custom design your home improvement project. They'll show you what is available and help you select the materials that are best for you. After your project is planned, your representative will give you a free estimate of the total cost, including all materials and labor. We also have the largest showroom of exterior home fashions around. This week's $50 lucky number winner is 6523 !